Our CEO, Ken Ampy, joined with the local organization Partnership for the Future for his second time to help provide high school males with a valuable lesson. The one day event began with Alex Ellis’ powerful message to “never underestimate the power of your image.” Mr. Ellis has been featured on CNN, Black Enterprise, The 700 Club, BET and the Steve Harvey Morning Show for his influential speaking. He uses his experiences and knowledge to educate others on how to be successful. 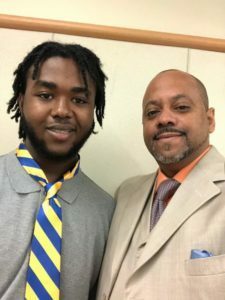 Ken participated by speaking with and mentoring his Varina High School protégé, Izaiah, while teaching him how to properly tie a tie. Partnership for the Future helps high school students with limited resources transition from high school to become successful, contributing members of our community.